A new landscape is taking shape at the heart of White City in west London. The first phase of White City Living, designed by architect Patel Taylor for developer St James, is coming out of the ground. The scheme is set within more than 10 acres of land, of which about 70 per cent is open space. 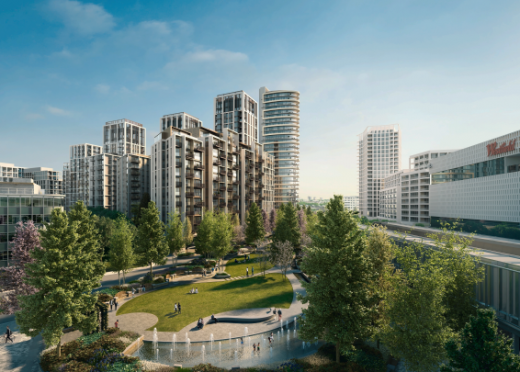 ‘The important aspect,’ said Roger Meyer, associate at Patel Taylor, ‘is that this is not a development next to a park, but one that is set within a park.’ The first phase of 406 homes will deliver significant public open space as well as residents gardens. There is a mix of suites, one and two bedroom homes in three building types, which the architect has defined as ‘pavilion,’ ‘mansion,’ and ‘skyline’. In addition there are the taller, 30-storey buildings, rising above the others to guide people to the park. Across the masterplan, the different collections of distinct buildings are unified by the restrained palette of materials, with precast concrete cladding used in shades of white and cream, defining a clear neighbourhood character in a long London tradition. The site is constrained on all sides, with road and rail lines running along it. As part of the project, a new connection has been made over the Central Line underground, linking through to the Television Centre to the west and there is a connection through a new railway arch to the Westfield shopping centre to the south. To the north of the site a major new campus is emerging for Imperial College. Patel Taylor’s masterplan established the framework for a range of different landscape settings within its park, with open lawns and intimate gardens; and extensive use of water in the lagoon, fountains and rills across the site. ‘lanterns’ at the top of the skyline buildings. Other buildings have porous corners, allowing residents and visitors to see through from one space to another. Patel Taylor has designed not only a great set of buildings for living in, but also a new place within the city. In the heart of one of the busiest, most densely occupied parts of the capital there will be a new green quarter which offers calm and repose coupled with excellent connections to all the nearby excitement and stimulation. The first apartments were released for sale in early September, with more information available from the Sales and Marketing Suite on site. Patel Taylor is now developing designs for the next phase of 400+ homes. London Architects Patel Taylor has been commissioned by St James to develop a residential-led masterplan for this 10.4 acre site. 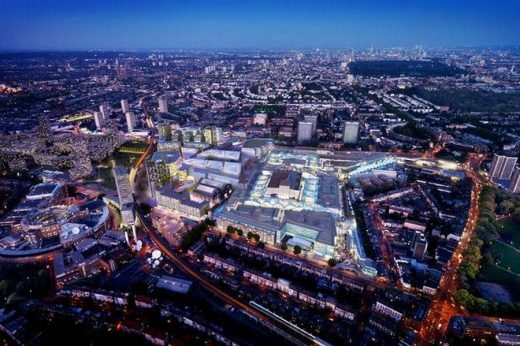 We are developing masterplan, architecture and landscape design proposals for the site which sits opposite the former BBC Television Centre and adjacent to Westfield Shopping Centre. 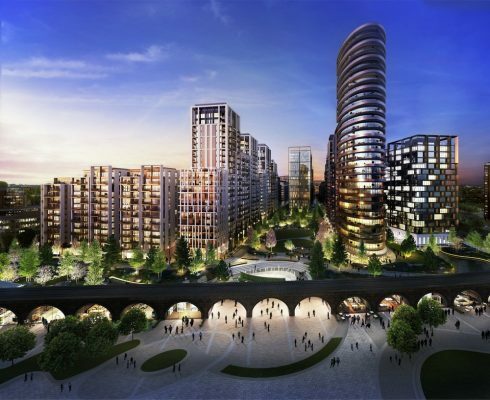 The development includes 1.5 hectares of open space in the form of a new public park for White City, 1500 new homes in a range of different sizes and tenures, including affordable housing, and commercial premises to support the residential development. Located behind Wood Lane Station and to the north of the Hammersmith and City line viaduct, it is a significant development site within the White City Opportunity Area.